Theremin World - Leon Started It - And It Keeps On Going! Today, August 15th, is Lev Termen's birthday, he was known as Leon Theremin in the U.S. 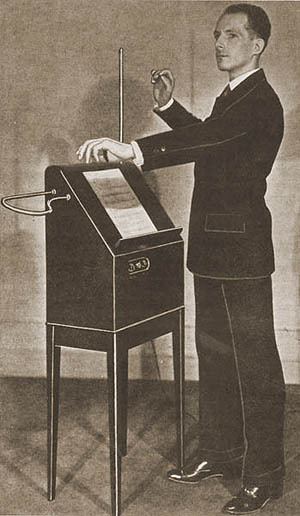 Invented around 1920, one of the first electric instruments, the theremin has survived and kept growing. Among the highlights of World Thereminization already this year are The St. Petersburg Theremin Festival which held its first gathering, the Hands Off UK 2011 theremin festival had record attendance and finished with concert of classical and contemporary music at the Scarborough Spa Theatre, the Festival Classique 2011 at the The Hague included the theremin for the first time played by Thorwald Jorgensen. And the theremin has been heard more than ever in jazz music by players like thereminist Kip Rosser with pianist Tara Buzash in the U.S and in Russia the international PetroJazz festival opened with a performance by DJ Shahash and thereminist Vladimir Kitlyar. Thank you again, Lev, for this incredible invention. We'll be playing tributes to you from around the globe. How did you celebrate the day are there other theremin events you've been to that are getting the word out?